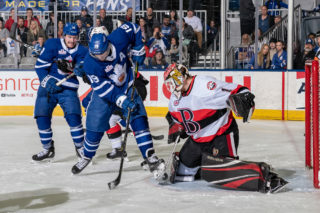 Following tonight’s 3-2 shootout win over the Belleville Senators, the Marlies closed out their annual Boat Show road trip 3-1-0-1, collecting seven of a possible 10 points and outscoring their opponents 19-17. The Marlies were granted an early opportunity on the power play as Belleville’s Chase Balisy was called for tripping. 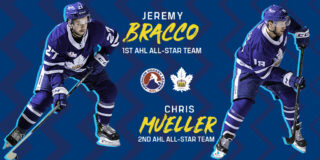 The Marlies converted on the ensuing man-advantage as Dymtro Timashov found Chris Mueller at the side of the net who then fed a centring pass to Jeremy Bracco. Bracco made no mistake firing a one timer past Marcus Hogberg to open the scoring at 1:41. At 7:08, the Marlies struck again as Calle Rosen sent a long feed to Timashov as he and Tom Sestito jumped out on a 2-on-0. Timashov sent Sestito a saucer pass and he tapped home his first goal with the Marlies to make it 2-0. The Marlies outshot the Senators 9-6 in the opening 20 and held a 2-0 lead heading into the second period. The Senators brought the score within one early in the second period as Logan Brown beat Michael Hutchinson with a wrist shot from an awkward angle. Andreas Englund and Drake Batherson assisted on the goal. The Senators peppered Hutchinson with 16 shots, but that would be the lone goal of the frame as the Marlies held a 2-1 lead after 40 minutes of play. 1:55 into the third frame, the Senators evened things up with a goal from Batherson. The score remained tied at the end of regulation resulting in 3-on-3 sudden death overtime. The extra time also didn’t yield a decision so the game went to a shootout. Rudolfs Balcers shot first for the Senators and was stopped by Hutchinson. Jeremy Bracco was the first to go for the Marlies but Hogberg shut the door. 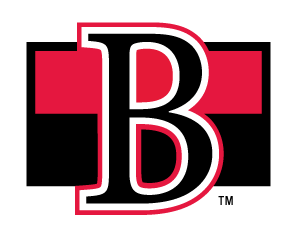 Belleville’s second shooter, Drake Batherson beat Hutchinson to give the Senators an edge. Mason Marchment answered right back to even things up. Logan Brown shot third for the Senators and was stopped by Hutchinson, setting the stage for Gabriel Gagne. Gagne beat Hogberg and sealed a 3-2 win over his former team. 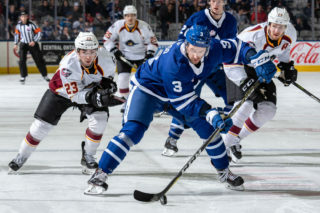 The Marlies will now have a few days off for the AHL All-Star break before returning home on February 1st to kick off a five-game home-stand. Jeremy Bracco opened the scoring on the power play at 1:41 of the first period. Bracco has 16 points (5 goals, 11 assists) in his last 12 games. He has 20 points (3 goals, 17 assists) on the power play. Tom Sestito scored at 7:08 of the first period. This is Sestito’s first goal for Toronto in his first game. Chris Mueller recorded the primary assist on Bracco’s power play goal in the first period. Mueller has recorded 27 points (13 goals, 14 assists) on the road this season. Calle Rosen registered the secondary assist on Sestito’s first period goal. Rosen has five points (1 goal, 4 assists) in his last five games. Dmytro Timashov registered the secondary assist on Bracco’s first period power play goal and picked up the primary assist on Sestito’s first period goal. Timashov has 29 points (5 goals, 24 assists) in 41 games this season. Michael Hutchinson stopped 28 of 30 shots he faced. Hutchinson is now 5-3-2-1 on the season with a .902 Save Percentage and a 3.31 Goals Against Average. Toronto went 3-for-3 on the penalty kill including a five-minute major in the third period and 1-for-3 on the power play. Toronto leads the AHL in away power play goals (29). Belleville had a 30-27 edge in shots in all situations. 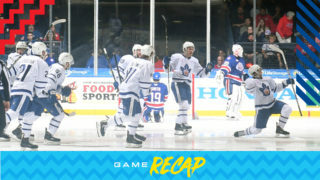 Andreas Borgman and Colin Greening led the Marlies with four shots on goal. Toronto’s away record is 13-5-1-3 and the team is second in the AHL in scoring on the road (102). 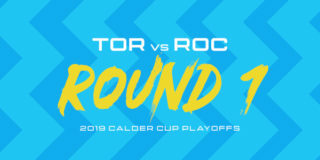 The Marlies are 15-13-3-3 against North Division opponents and are 3-3-1-0 against the Senators. Belleville has outscored Toronto 26-25. The Marlies finish their annual Boat Show road trip 3-1-0-1, collecting seven of a possible 10 points and outscoring their opponents 19-17. Toronto is 19-4-1-1 when scoring first. The Marlies are 15-1-1-1 when leading after the first period and 16-0-1-1 when trailing after the second period. Toronto is 8-8-1-2 when outshot by their opponent. The Marlies are 8-5-0-0 in Saturday games and are 7-3-0-1 in January. Michael Carcone (concussion) did not dress for tonight’s game. He served a match penalty in the third period of Toronto’s game on January 12 against Rochester and did not return. Steve Oleksy (concussion) did not dress for tonight’s game. He left Toronto’s game on January 5 against Syracuse and did not return. Rasmus Sandin (elbow sprain) did not dress for tonight’s game following an injury sustained during the World Juniors. January 24: Returned forward Trevor Moore on loan from Toronto (NHL). January 23: Recalled forward Trevor Moore from loan by Toronto (NHL). He’s pretty happy as he should be. He put in a lot work in preparing the team today. It was not a good day for us yesterday at all. But we made some adjustments and the guys responded very well at crucial times. That’s the best part of it because the penalty kill was really an issue for us yesterday and it was called on to save the game for us today and it responded perfectly so it was really great. I really liked our first period. I like a lot about it. Obviously, it built the lead. And then our second period, I didn’t like much about it at all. Then I thought our third period was a little more even. I liked chunks of it and of course, you like how the team responds, a lot of adversity there. We’re a tired team here, we played like a tired team here this week. That’s 10 of the last 11 days that we’ve spent on the road here and I think it took its toll on us. But fortunately, now, we’ve put a couple points in the bank and you get to enjoy some time away. 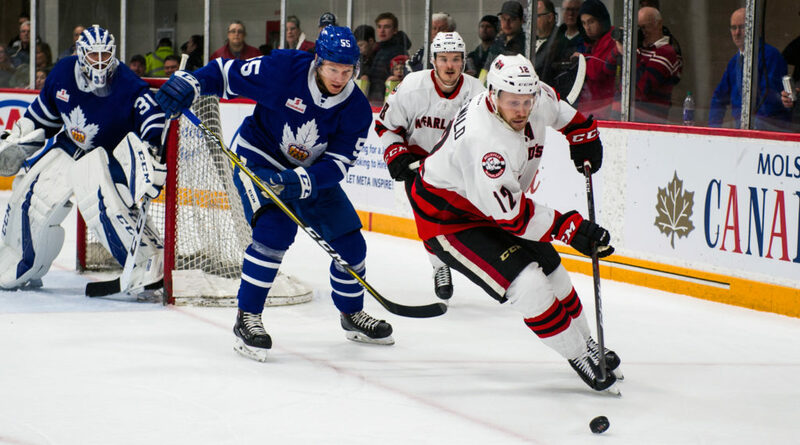 The Toronto Marlies close out their Boat Show road trip tonight in Belleville when they visit the Senators for the second time in as many days. 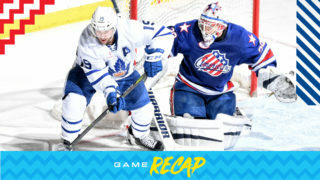 After kicking off their road trip with back-to-back wins, the Marlies have since dropped their previous two contests. They’ll be looking to get back in the win column tonight and end their road trip on a positive note before the AHL All-Star break. With the win last night, the Senators improved to 20-23-2-0 and now hold a 4-2 lead in the season series. They’ve won their previous two contests and are 4-6 in their last ten. The Marlies are now 12-6-1-3 on the road and 21-16-3-3 on the season. Players to watch: Carl Grundstrom scored his 13thof the season last night and now sits seventh in rookie scoring with 29 points. Colin Greening scored the opening goal for the Marlies, his third point in his last three games. Puck drops at 7:00 PM on AHLTV. Fans can also follow us on Twitter for live game updates.